Why Is Email Spam Still A Problem? Bill Gates famously said “two years from now, spam will be solved” back in 2004. It’s now ten years later and more than 70% of emails are spam, according to Kaspersky. Why is spam still such a problem? While spam may never be fixed as long as email is around, the situation has improved a bit. Spam filters have become much more effective — it’s easy to forget how much they’ve improved over the past decade. “Spam” is just a term for unsolicited bulk email messages. Spam encompasses everything from ads for products and services, drugs, pornographic content, money scams, stock market pump-and-dump schemes, malware, phishing and everything in between. To many of us, spam emails are formulaic and their tricks are so obvious. It’s easy to look at spam and laugh, but the unfortunate reality is that people are still falling for spam. Maybe they fall for the old “Nigerian prince” email and lose money, buy a penny stock they see advertised in spam,order some cheap pharmaceuticals of questionable purity, fall for a clever phishing email, or click a link and download malware. There are people out there falling for these spam messages every day. If there weren’t, we wouldn’t see so much spam. Spam is very cheap to send. Delivering a piece of mail to your physical mailbox requires someone to get the letter together, address the mail, pay for postage, and take it to the post office. The postage alone would make this cost-prohibitive. That’s why our mailboxes aren’t full of letters from “Nigerian princes” and questionable pharmacies. On the other hand, emails are easy to send. It doesn’t take much computer resources to send huge amounts of emails, and there’s no equivalent to postage to cost spammers money. Spammers can even use infected computers — or botnets — to send these emails out, so they don’t have to pay for legitimate computing resources of their own. Spam is practically free to send. 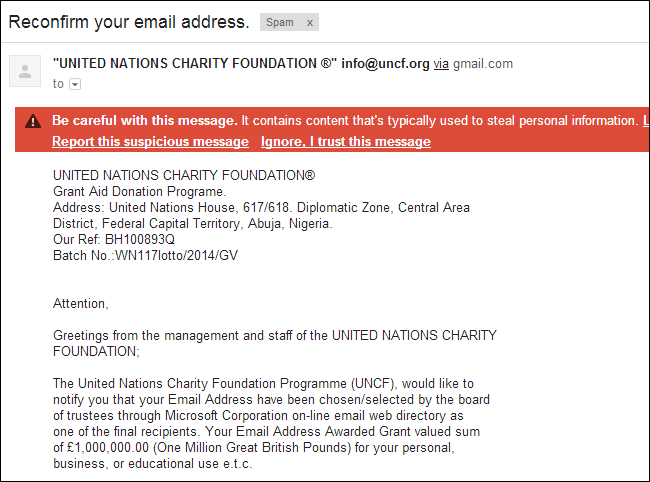 Because of this, it doesn’t matter that the majority of people will never fall for a spam email. If just one out of every 50,000 people who gets an email falls for it, that may be enough for the spammer to make a profit. For financial scam emails, scammers can probably make a good payday if just one in a million people falls for for their trick and sends money. No organization controls email, which is different from many other closed communication services. Take Facebook, for example. If spam becomes a major problem on Facebook, Facebook’s engineers can see the spam information and block it at the source. Once they identify the spammer, they can remove all of their spam so no one on Facebook will see it. They can prevent you from communicating with people who you don’t know or limit you to a certain number of messages sent per hour. They can scan all messages and block the ones that look like spam. Their changes would fix the problem for everyone on Facebook. Facebook runs the show here. Email is different. Anyone can operate their own email servers, and many emails are sent to people who aren’t in each other’s address books. An email server can send as many emails as it wants. Even after a message is marked as spam in Gmail, Outlook.com, and Yahoo! Mail, it may not be marked as spam on other email services. Email servers without good spam filters will be vulnerable. There’s no one point where spam can be cut off for absolutely everyone. So how would we even begin solving the spam problem? Well, we could pass laws making spam illegal, have legitimate services shut down spammers who use their services, and develop good spam filters to prevent as many spam messages as possible from reaching people’s inboxes. We’ve done all of these things, but the laws can’t reach into foreign countries and the spam filters will never be perfect. Why Didn’t Microsoft Solve Spam? 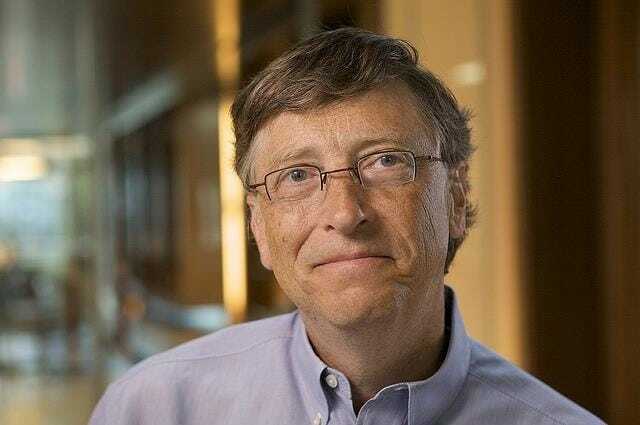 Bill Gates said Microsoft was working on three approaches to solving spam back in 2004. A “challenge” that only a human could solve. In other words, you’d send someone an email and have to answer a question that proves you’re a human — think CAPTCHAs for email. A “computational puzzle” that a computer sending a few emails could easily solve, but a computer sending many emails would take a long time to solve. This would make it practially impossible for computers to send out bulk emails. A level of “monetary risk” built into sending emails. You might have to pay to send an email, and if they email was unsolicited, the money would be kept. This would add a cost to sending emails, making spam too expensive to send for the return spammers get. Bill Gates was most keen on this solution. There are many problems with these ideas — businesses sending out legitimate automated emails, like online shopping receipts, wouldn’t be able to solve a challenge for each and wouldn’t want to invest in additional computational resources. And no one wants to hook up a credit card to their email account and pay money every time they send an email. The real problem with these ideas is that they’re not compatible with the way email currently works. Microsoft can’t just change the way email works on their own — even if they changed the way Hotmail, Outlook, and Exchange handled emails, they’d still have to interoperate with all the other email services and servers out there. Microsoft would have had to convince an entire industry to move to a new standard for sending messages with these anti-spam features built in. It was probably a near-impossible task, but they never even tried. Rather than solving spam, we’ve been forced to develop better spam filters to block it. If you use a service like Gmail, Outlook.com, or Yahoo! Mail, you have much better spam filters than you did a decade ago. It’s impossible to fix spam without changing the way email works, so the problem will never be completely solved.